BEIRUT (AP) — Two rival Lebanese Christian leaders reconciled Wednesday ending four decades of enmity triggered by a massacre of dozens during Lebanon’s 1975-1990 civil war. Samir Geagea, leader of the Lebanese Forces group, and Sleiman Frangieh of the Marada Party shook hands and kissed each other on the cheeks at the headquarters of the Maronite Christian church north of Beirut. The reconciliation was sponsored by Cardinal Bechara al-Rai, head of the Maronite church, Lebanon’s largest. 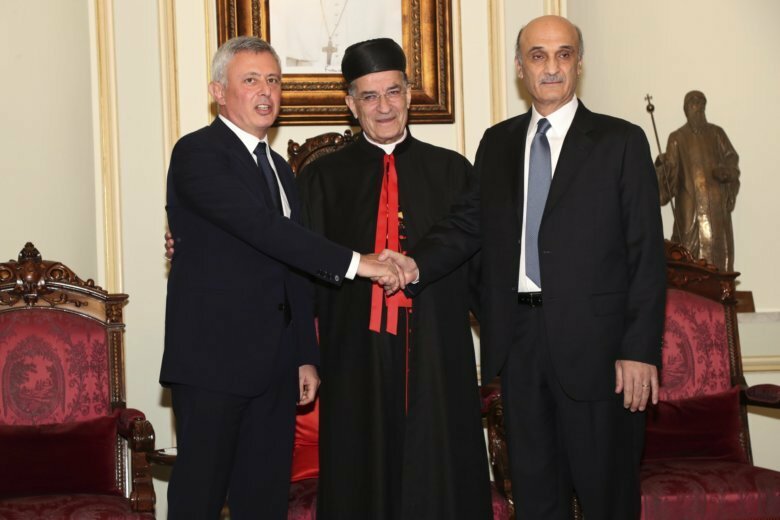 Geagea and Frangieh met in the past, but Wednesday marked the end of a bitter rivalry tainted with blood. The two leaders are Maronite Christian and are both presidential hopefuls. Their reconciliation comes at a time when both their relations have become tense with foreign minister, Gibran Bassil, another presidential hopeful who heads the Free Patriotic Movement founded by President Michel Aoun. According to Lebanon’s power-sharing system, Lebanon’s president must be a Christian Maronite. Frangieh is a close friend of Syrian President Bashar Assad and is allied with the militant Hezbollah group while Geagea is with the Western and Saudi-backed coalition and is a harsh critic of both Assad and Hezbollah leader Sayyed Hassan Nasrallah. In 1978, members of the main Christian militia killed Frangieh’s father, Tony, as well as his mother and sister and 30 Marada fighters and supporters. Geagea led the raid in the mountain resort of Ehden but was seriously wounded and withdrew from the operation. Last week, Frangieh met with the families of those killed four decades ago and asked if he can go ahead with the reconciliation and received their support.